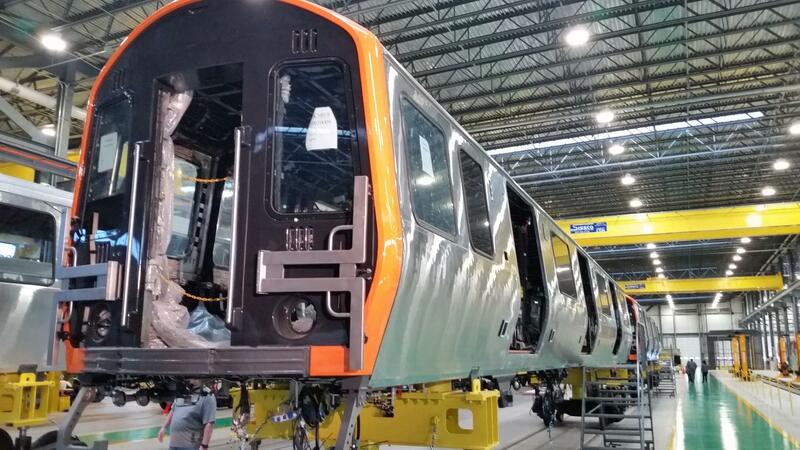 A new subway car for the MBTA's Orange Line on the production line at the CRRC-MA factory in Springfield, Massachusetts. Trade negotiations between the U.S. and China are scheduled to resume this week. The outcome of the talks will be closely watched in western Massachusetts, where manufacturing jobs are at stake. Inside a sprawling factory roughly the size of three football fields, Nashira Irvin of Springfield and dozens of co-workers are assembling new subway cars for Boston’s Massachusetts Bay Transportation Authority ( MBTA). "This is big for us right here. We've never had anything here in Massachusetts like this," she said. The Chinese railcar manufacturer CRRC built the $95 million factory in Springfield after winning a multi-year contract in 2014 to deliver over 400 new subway cars to replace the MBTA’s entire fleet on the Orange and Red lines. The first pair of new Orange Line cars rolled off the assembly line in December. Sixty percent of the parts on each new subway car are made in the U.S., according to CRRC –some come from precision machine shops in the region, which adds a multiplier to the factory’s impact on the western Massachusetts economy. But since last October, when the Trump administration slapped new tariffs on Chinese imports, CRRC has had to pay more to bring to the Springfield factory the subway car shells and other parts, according to CRRC MA spokeswoman Lydia Rivera. "We are being tariffed on our products coming through the Port of Albany," said Rivera. "It is significant and it if continues, we were not expecting that cost." In arguing that the tariffs on CRRC are “unfair,” Rivera points to the jobs that have been created in Springfield -- 130 union manufacturing jobs with good wages and full benefits. There are supplier contracts with local businesses and a workforce development partnership with Springfield’s vocational high school. "CRRC is doing something positive in the community," said Rivera. "The focus is on us with these tariffs and it is clearly unfair." CRRC filed applications for waivers from the tariffs with the Office of the United States Trade Representative. Letters of support for the waivers have been written by members of the state’s Congressional delegation, Springfield’s mayor, and other elected officials. It is unclear how much the tariffs add to the cost of each new subway car. Democratic State Senator Eric Lesser of Longmeadow said state lawmakers might look into ways to help offset the costs if the tariffs are not lifted. "There's a very compelling case for why this waiver is nccessary," said Lesser. "It would literally threaten the jobs of hundreds of people if the waiver is not granted." At an event in December marking the production of the first two Orange Line subway cars at the Springfield factory, Republican Gov. Charlie Baker said the tariffs will not change the state’s commitment to the project. "This is important and we are going to get it done kinda no matter what," said Baker. The Springfield factory also has contracts to build new rail cars for the transit systems in Philadelphia and Los Angeles. There is a threat to CRRC’s future in Springfield that has nothing to do with the current trade war. There are efforts by lawmakers in both Washington and Boston to ban government funded contracts with state-owned entities such as CRRC on the grounds of national security. It is feared that computer software could be put in the new subway cars for espionage or other nefarious purposes. "To think that security concerns would be an issue and vulnerability is clearly mistaken," said Rivera. A spokesman for the MBTA said no software components for the new vehicles are manufactured in China. Massachusetts Governor Charlie Baker was in Springfield today to mark a milestone for local manufacturing and bring much needed upgrades to the largest public transit system in the state. The first prototype of new subway cars that will eventually be manufactured in western Massachusetts are being shipped this week from China to Boston. Massachusetts Governor Charlie Baker toured the nearly completed $95 million subway car factory in Springfield Thursday. The facility will provide good-paying jobs for people in western Massachusetts and improved mass transit in the eastern part of the state. Massachusetts Gov. Charlie Baker was in Springfield today to mark a major milestone in the construction of a $95 million rail car factory.